Kaju Katli: Kaju katli or Kaju Katari or Kaju barfi is an Indian dessert similar to a barfi traditionally eaten during the festival of Diwali. 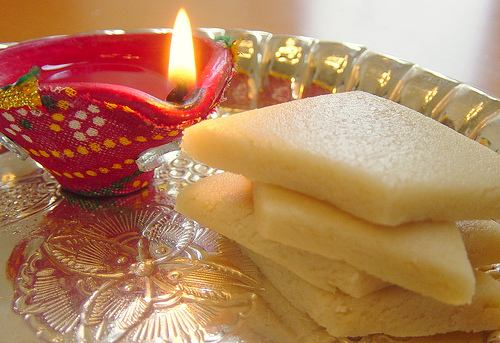 Kaju means cashew nut in Hindi and barfi is often but not always; made by thickening milk with sugar and other ingredients (dry fruits and mild spices). To prepare this dessert, cashew nuts are soaked in water overnight and ground the next day (milk is not used). Sugar solution is boiled down to single thread syrup, and is added to the ground cashews. Keep the cashew nuts out from the refrigerator and pat dry it and bring it to normal room temperature. The cashew nuts should not contain any moisture while grinding else it will become soggy and not into a powder. Grind the cashew into a fine powder. Note: Do not over grind as the cashew nuts will start emitting oil and the powder will become oily. In a think bottomed non-stick pan, mix sugar and 5-6 tablespoon water. Cook till the sugar is dissolved, stirring continuously. Keep cooking till the sugar syrup reaches one string consistency. Note: You can check the one thread consistency of the syrup between the thumb and the index finger. This step is important. Add in the cashew nut powder. Start stirring it in a low flame. Keep cooking till the mixture reaches a soft dough consistency. Note: Do not overcook the mixture, over cooking will result in hard burfis. Transfer the mixture to a plate. Let the mixture cool down to a moderate temperature. Transfer the kneaded dough to the greased plate. Roll the dough, using a rolling pin, to 1 inch thickness. Cut the rolled dough in diamond shape (or in desired shape). Kaju katli’s are ready to be served. Serve the kaju katli at room temperature. Note: You can sprinkle little warm milk, if the mixture is too dry; but adding milk also reduces the shelf life of the Kaju katli. If you have any queries regarding the Kaju Katli recipe, please leave a comment.